“Understand that securities are not net economic wealth. They are a claim of one party in the economy - by virtue of past saving - on the future output produced by others. Fundamentally, it's the act of value-added production that ‘injects’ purchasing power into the economy (as well as the objects available to be purchased), because by that action the economy has goods and services that did not exist previously with the same value. True wealth is embodied in the capacity to produce (productive capital, stored resources, infrastructure, knowledge), and net income is created when that capacity is expressed in productive activity that adds value that didn't exist before. “New securities are created in the economy each time some amount of purchasing power is transferred to others, rather than consuming it. Once issued, all of these pieces of paper can vary in price later, so the saving that someone did in a prior period, embodied in the form of some paper security, may be worth more or less consumption in the current period than it was initially. That’s really the main effect QE has - to encourage yield-seeking speculation that drives up the prices of risky securities, but without having any material effect on the real economy or the underlying cash flows that those securities will deliver over time. Following the British referendum to exit the European Union, the paper value of global assets briefly fell by about $3 trillion. This decline in the market capitalization immediately garnered headlines, suggesting that some destruction of “value” had occurred. No. The value of a security is embodied in the future stream of cash flows that will actually be delivered into the hands of investors over time. What occurred here was a paper loss. While the recent one was both shallow and temporary, get used to such headlines. In the U.S. alone I fully expect that $10 trillion of paper wealth will be erased from U.S. equity market capitalization over the completion of the current market cycle. While any given holder can sell their securities here, somebody else has to buy those same securities. 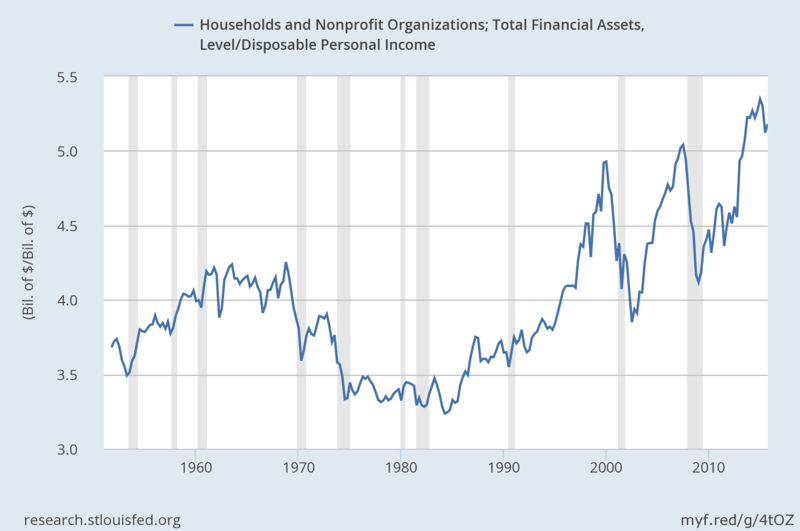 The fact that valuations are obscene doesn't mean that the economy has created more wealth. It just means that existing holders of stocks and long-term bonds have a temporary opportunity to obtain a wealth transfer from some unfortunate buyer. Whoever ends up holding that bag will likely earn total returns close to zero on their investment over the coming 10-12 year horizon, with profound interim losses on the way to zero returns. Part of the discussion below repeats portions of recent commentaries. 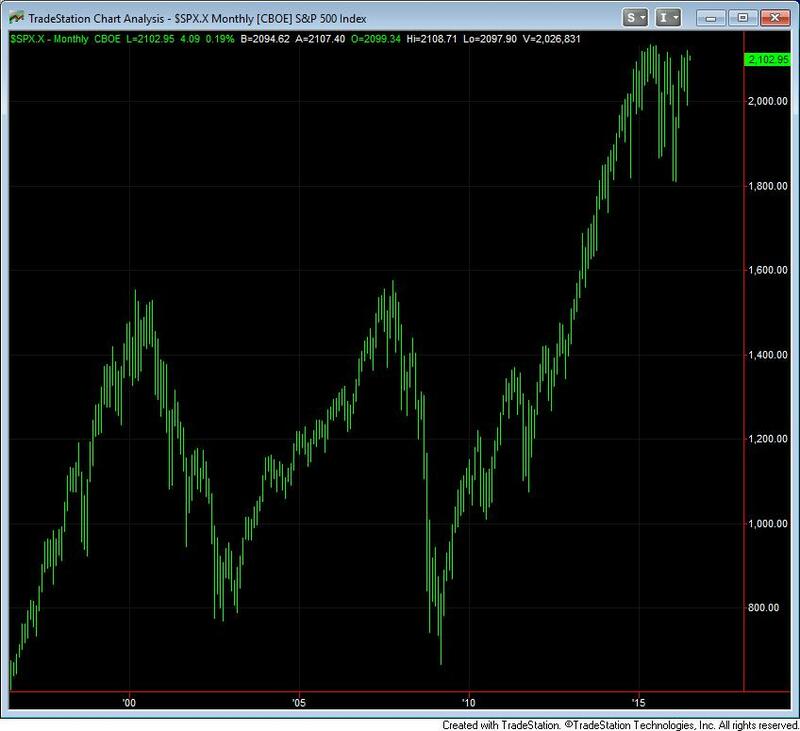 While we may or may not observe further short-run speculative extremes, I can't think of a more important set of principles that a long-term, risk-conscious investor should understand at present. The higher the price an investor pays for a given stream of future cash flows, the lower the long-term return the investor can expect to achieve over time. As the price of a security rises, what investors considered “expected future return” only a moment before is suddenly converted into “realized past return.” The higher the current price rises, the more expected future returns are converted into realized past returns, and the less expected future return is left on the table. Because of this dynamic, the point where a security seems most enticing on the basis of realized past returns is also the point where the security is least promising on the basis of expected future returns. See Blowing Bubbles: QE and the Iron Laws for a straightforward demonstration of this idea. Despite Bernanke's assurances, speculation in mortgage debt had already changed the return/risk characteristics of the housing market, fueled by yield-seeking speculation in response to a Federal Reserve that dropped short-term interest rates to just 1% after the tech bubble collapsed. A market that had historically been safe and nearly immune from widespread loss ended up provoking the deepest economic crisis since the Great Depression. Likewise, speculation in equities, junk debt and even investment grade debt has dramatically changed the return/risk profile of these asset classes in recent years, to the point where they bear no resemblance to what passive investors might expect based on historical norms. When one stops to realize that the amount of global debt yielding negative interest rates now exceeds $12 trillion, it should be clear how extreme central bank distortions have become. To imagine that equity valuations have not already fully responded to this situation after years of yield-seeking competition is, quite frankly, ignorant both of reliable valuation measures and of financial history. I distinguish “activist monetary policy” from “rules-based monetary policy”; the fluctuations in interest rates and the monetary base that can be predicted from past values of non-monetary variables alone, such as GDP, inflation, and unemployment. Statistically, it’s difficult to determine whether that “predictable” component of monetary policy is economically useful or not, since by definition, it's perfectly correlated with non-monetary data and “spans the same space.” What we can say, however, is that deviations from those predictable monetary responses - “activist” policy interventions - have no reliable or economically significant impact on the subsequent performance of the economy, other than to create yield-seeking bubbles that exert violent long-term injury when they collapse. 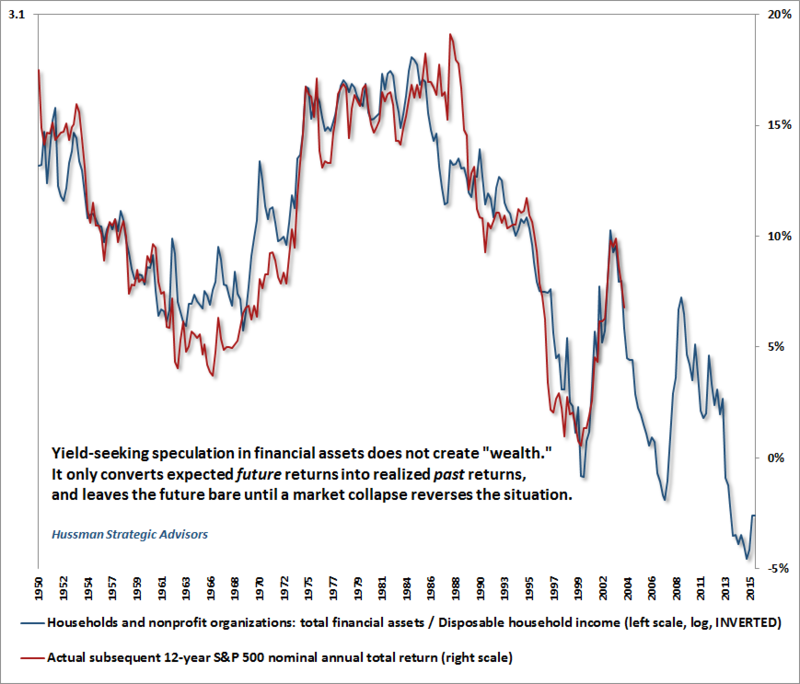 The bottom line is this: speculation does not create wealth. The true wealth of a nation is in its accumulated stock of productive capital, stored resources, infrastructure and knowledge. This wealth contributes to the nation’s income and welfare when it is used to create value-added output - goods and services did not exist before, that have a greater value than the inputs used to produce them. It shouldn’t be surprising, then, that the ratio of market capitalization to corporate gross value-added is the single most reliable valuation indicator we identify, with a 93% correlation with actual subsequent 10-12 year total returns in the S&P 500 (see The New Era is an Old Story). We expect $10 trillion of “paper wealth” to be wiped from the U.S. equity market over the completion of this cycle, because it is not “wealth” at all. Again, since every security that is issued has to be held by someone until it is retired, the main consequence of Fed-induced speculation is the opportunity for wealth transfer - the chance for existing holders to sell their overvalued securities to some poor bagholder who will reap the whirlwind over the completion of the market cycle. We wish this on nobody, but it’s unavoidable that someone must assume that role. Those bagholders would best be those who understand our concerns and either accept the risks or choose to deny them. If we learned one lesson during the half-cycle since 2009, it was that the Fed’s recklessly experimental policy of quantitative easing was able to encourage yield-seeking speculation long after the emergence of warning signs that were reliably followed by market plunges in previous market cycles, so one had to wait for market internals to deteriorate explicitly before adopting a hard-negative market outlook. We need no further lessons on that subject. Meanwhile, keep in mind that central bank easing only reliably encourages speculation when investors are already inclined to seek risk. As we’ve demonstrated in both U.S. and Japanese data, central bank easing fails to support stocks (beyond an immediate knee-jerk rally) once market action has deteriorated and investors are inclined toward risk aversion. In a risk-averse environment, safe liquidity is a desirable asset, not an inferior one, so creating more of it doesn’t ignite yield-seeking. The Japanese stock market has suffered two separate losses in excess of 60% since 2000 despite short-term interest rates that were regularly pegged at zero, and never above 1%, during the entire period.